Barbara has posted her mini and it adorable! Do check it out (here). And Janet has not only finished her October mini, but has changed her Sajou quilt and it is sensational. See them both (here). So… in the meantime, I figured I’d better practice my wool work skills. 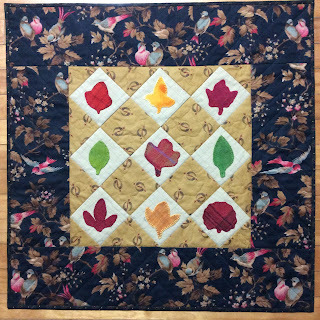 I chose 9 of the leaf blocks in the Mary Witherwax (Collector with a Needle pattern) quilt (yet another project that I have been wanting to start) and started “practicing”. I love the way it turned out and have appropriately named it “Wooly Witherwax”. I hope Mary would approve. 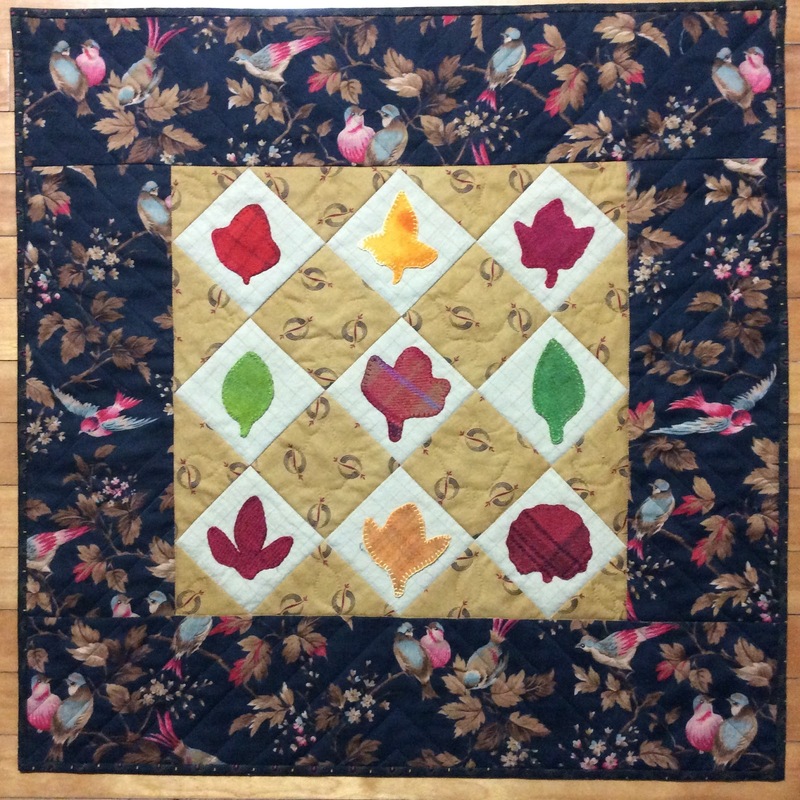 I know a few of my cohorts have finished their Humble Quilts "Sajou" project so grab a cup of tea and hop on over to Lori's blog post (here) and see all the wonderful renditions. It never ceases to amaze me how different they can be. What fun! I recognized those leaf shapes right away as having come from the Witherwax pattern. I wonder if I have that bird print. If not, I must have something similar. Anyhow, I like it very well as your border. You still remember how to work with wool! Wooly Waxworth is a lovely fall addition. You've still got the touch. I look forward to seeing what you and Randy are up to. Ooh, I love Wooly Witherwax! What a great way to practice your skills in anticipation of another 'great' quilt! Can't wait to see your next one! Sweet little wool mini. How perfectly are those little love birds perched on the top of the center. I love that fabric and had it in brown. who is this Piseth? I wish they would Piseth-off they keep spamming me too. Wendy! This is such a cute little mini - the varied colorful leaves. One of these times I will jump in with your monthly minis. Are you continuing in 2019? Oh that's the perfect project to get your feet wet, Wendy!! Cute! The wool leaves look like candy - great colors! 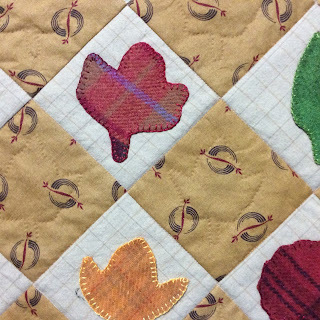 Love your wool quiltlet! The stitching is great!! How sweet. I love your stitches around the leaves. Did you put anything on the back of the wool before stitching the leaves down, Wendy? Love the plaid wool leaves, set off perfectly with that dramatic border. Noah and Matilda 5E and "the big reveal"